Leasing: A lease is a contractual procedure calling for the lessee (user) to pay the lessor (owner) for use of an asset. Lease usually involves two parties which include the lessor (owner) and the lessee (user). In this arrangement, the lessor transfers the right to use to the lessee in return of the lease rentals agreed upon. Lease agreement can be made flexible enough to meet the financial necessities of both the parties (Maheshwari, 1997). In technical terms, Lease is a contract in which one party conveys the use of an asset to another party for a specific period of time for a predetermined payment amount. 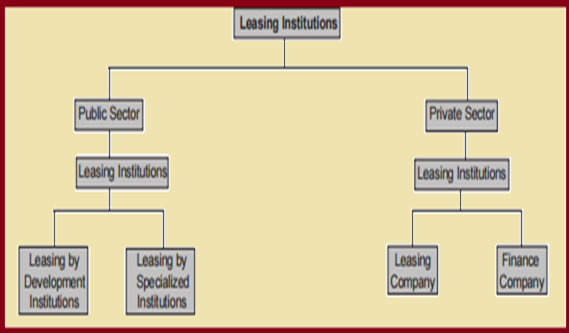 In leasing, there is mainly three parties involved that include Lessor, Lessee and Vendor. Lessor: The person owning the Asset/Equipment which is being leased. Lessee: The person to whom Lessor gives on Lease the Asset. Lessee is the user of equipment being leased. Vendor: The person from whom the Lessor has acquired the Asset for the purpose of giving on Lease to Lessee. Parties: These are essentially two parties to a contract of lease financing, namely the owner and user of the assets. Lease broker: Lease broker is an agent in between the leaser (owner) and lessee. He acts as an intermediary in arranging the lease deals. Merchant banking divisions of foreign banks, subsidiaries indian banking and private foreign banks are acting as lease brokers. Lease assets: The lease assets may be plant, machinery, equipments, land, automobile, factory, building etc. Offers conditions for renewal or non-renewal. May have a particular list of conditions which are therein described as Default Conditions and specific Remedies. May have other specific conditions placed upon the parties. Which party is responsible for maintenance? Termination clause which explains what will happen if the contract is ended early or cancelled, stating the rights of parties to terminate the lease, and their obligations. Rental/Operating Lease: Under this deal, the Lessor gives the asset to Lessee on Rent and all the risk and rewards incident to ownership of the asset kept with Lessor only. Practically, it is the deal where Lessee does not have choice to buy the asset at the end of the Term of the Lease. In accounting language, this type of lease deal is also known as operating lease. Financial Lease: This type of deal is also called Credit Contract Deal. Under this deal, the Lessor gives the asset to Lessee on Rent and all the risk and rewards incident to ownership of the asset are being transferred to Lessee. It is the deal where Lessee has choice to buy the asset at the end of the Term of the Lease and it is in fact confirmed at the beginning of lease that the Lessee will exercise that option. Finance Lease: Financing lease is also known as full payout lease. It is one of the long-term leases and cannot be cancelled before the expiry of the agreement. It means a lease for terms that approach the economic life of the asset, the total payments over the term of the lease are greater than the leasers initial cost of the leased asset. Operating Lease: Operating lease is also termed as service lease. Operating lease is one of the short-term and cancelable leases. It means a lease for a time shorter than the economic period of the assets, normally the payments over the term of the lease are less than the leaser’s initial cost of the leased asset. Sale and lease back: Sale and lease back is a lease under which the leasee sells an asset for cash to a potential leaser and then leases back the same asset, making fixed periodic payments for its use. It may be in the firm of operating leasing or financial leasing. It is useful process of leasing which enables the financial liquidity of the company. (Two parties in the lease) or Tripartite lease. (Three parties in the lease). Single investor lease: single investor lease is the kind of lease which belongs to only two parties such as leaser. It consists of only one investor (owner). Normally, all types of leasing such as operating, financially, sale and lease back and direct lease fall in this categories. Leveraged lease: This category of lease is used to obtain the high level capital cost of assets and equipments. There are three parties involved in this lease; the leaser, the lender and the lessee. In the leverage lease, the leaser acts as equity participant supplying a fraction of the total cost of the assets while the lender supplies the major part. Domestic lease: In the lease contract, if both the parties belong to the domicile of the same country it is known as domestic leasing. International lease: international leasing is one in which the lease transaction and the leasing parties belong to the domicile of different countries. There are many advantages of leasing (Maheshwari, 1997). It is simple to negotiate. Reduces need for capital investment. Rentals can be planned according to cash flow. Tax saving to leases as rentals are changed against profit. Protection against loss by obsolescence to the lease. No bad debts to lessor. Higher pay-out obligations may be harmful to lease. Use of equipment may be restricted to lessor. Default may cause higher rentals or early return of assets. Assets used in business not disclosed in balance sheet. Leasing finance becomes widespread and effective financial sources for most of the business concerns. With the significance of lease finance, banks and financial institutions offer leasing financial assistance to the industrial concern. 20th Century Leasing Corporation Ltd.
Cholamandal Investment and Finance Company Ltd. Hire purchase is type of the legal contract, in which a buyer agrees to pay for goods in parts or a percentage over a number of months. Hire purchase is used to buy luxurious products which a person cannot afford to pay out right such as a car. A down payment is generally paid and the balance is paid over several months as a monthly instalments (Steve Carter, 1997). In countries like Canada and the United States, a hire purchase is termed an instalment plan although these may vary marginally as in a hire purchase agreement, the ownership of the goods remains with the merchant until the last payment is done. Other similar practices are described as closed-end leasing or rent to own. The hire purchase agreement was established in the United Kingdom in the 19th century to permit customers with a cash shortage to make a luxurious purchase. It was done because companies did not want to lose customers or delay the buying process. According to hire purchase act of 1972, an agreement under which goods are let on hire under which the hirer has an option to purchase them in accordance with the terms of agreement and include an agreement under which Possession of goods is delivered by the owner thereof to a person on the condition that such person pays the amount in periodic payments. The property of the goods is to pass to such a person on the payment of the last instalment. Such a person has a right to dismiss the agreement any time before the property so passes. Abundant of management studies have explained concept of hire purchase system. Many theorists defined that “Hire Purchase System is a system under which money is paid for goods by means of periodical instalments with the view of ultimate purchase. All money being paid in the meantime is regarded as payment of hire and the goods become the property of the buyers only when all the instalments have been paid. J. Stephenson stated that “The hire-purchase is a form of trade in which credit is granted to the customer on the security of a lien on the goods." From the above descriptions it is established that the buyer takes the delivery of the article on the payment of first instalment and becomes the owner only after paying the final instalment. Hire purchase type of business is generally carried in the case of durable consumer articles such as sewing machines, televisions, desert coolers and refrigerators. Hire purchase involves a definite procedure to be followed. For this, an agreement called hire purchase agreement is made in written between the parties involved in the hire purchase transaction. The hire purchase price of the goods to which the agreement relates. The cash price of the goods, that is to say, the price at which the good is purchased for cash. The date of the beginning of the agreement. The number and time interval of instalments by which the hire purchase price is to be paid. The name of goods, with its sufficient identity, to which the hire purchase agreement relates to. The amount to be paid, if any, at the time of signing the agreement. The signatures of the parties involved in transaction. When the hire purchase deal is funded by the manufacturer or dealer, then two parties, called, hire vendor and hire purchaser, are involved in the agreement. 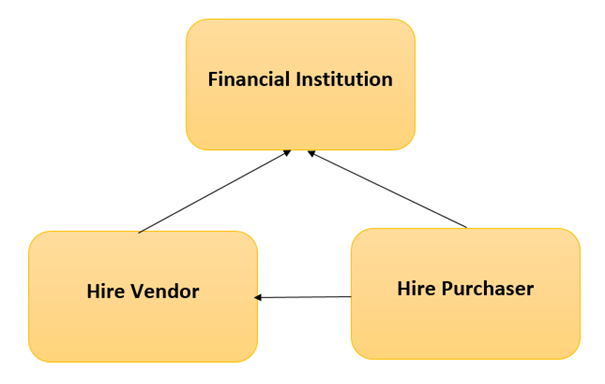 The hire purchase transaction is financed by some financial institution, and then there are three parties involved in the transaction. These are Hire Vendor, Hire Purchaser, and Financial Institution. In such case, the vendor, initially receives the bills of exchange for hire purchase price of the goods from the hirer. The vendor, then, discounts the bills with the financial institution and gets payment for the goods sold under hire purchase system. The financial institution collects the payments of the bills from the hirer, as and when the instalments fall due. Convenience in Payment: The buyer gets advantage as he has to make the payment in instalments. This system is greatly beneficial to the people having limited income. Increased Volume of Sales: This system fascinates more customers as the payment is to be made in easy instalments. This leads to increased volume of sales. Increased Profits: Large volume of sales guarantees increased profits to the seller. Encourages Savings: It boosts thrift among the buyers who are forced to save some portion of their income for the payment of the instalments. This inculcates the habit to save among the people. Helpful for Small Traders: This system is highly beneficial for the small manufacturers and traders. They can purchase machinery and other equipment on instalment basis and in turn sell goods to the buyer charging full price. Earning of Interest: The seller gets the instalment which includes original price and interest. The interest is calculated in advance and added in total instalments to be paid by the buyer. Lesser Risk: From seller's viewpoint, this system is greatly beneficial as he knows that if the buyer fails to pay one instalment, he can get the article back. Higher Price: A purchaser has to pay higher price for the article purchased which includes cost plus interest. The rate of interest is normally quite high. Artificial Demand: Hire purchase system creates false demand for the product. The buyer is desirous to purchase the products, even if he does not need or afford to buy the product. Heavy Risk: The seller runs a heavy risk under such system, though he has the right to take back the articles from the defaulting customers. The second hand goods make little price. Problems to recover instalments: It has been perceived that the sellers do not get the instalments from the buyers on time. They may choose immoral buyers which may put them in trouble. They have to waste time and incur extra expenditure to recollect the instalments. This sometimes leads to serious fights between the buyers and the sellers. Break Up of Families: The system puts heavy financial load on the families which cannot afford to buy costly and luxurious items. In many studies, it has been shown that many happy homes and families have been broken by hire purchase buying's. It is said that hire purchase in similar to leasing with the exception that ownership of the goods passes to hire purchase customer on payment of the final payment instalment, whereas a lessee never becomes the owner of the goods (Steve Carter, 1997). Ownership of the Asset: In lease, ownership lies with the lessor. The lessee has the right to use the equipment and does not have an option to purchase. However in hire purchase, the hirer has the choice to purchase. The hirer becomes the owner of the asset/equipment immediately after the last instalment is paid. Depreciation: In lease funding, the depreciation is demanded as an expense in the books of lessor. Instead, the depreciation claim is allowed to the hirer in case of hire purchase deal. Rental Payments: The lease rentals cover the cost of using an asset. Usually, it is derived with the cost of an asset over the asset life. But in the process of hire purchase, instalment is inclusive of the principal amount and the interest for the time period the asset is used. Duration: Normally lease agreements are done for longer duration and for big assets such as land, property. But hire Purchase agreements are done generally for shorter duration and cheaper assets such as hiring a car or machinery. Tax Impact: In lease agreement, the total lease rentals are revealed as expenditure by the lessee. In hire purchase, the hirer claims the depreciation of asset as an expense. Repairs and Maintenance: Repairs and maintenance of the asset in financial lease is the responsibility of the lessee but in operating lease, it is the responsibility of the lessor. In hire purchase, hirer is responsible for maintenance. Extent of Finance: Lease financing can be called the complete financing choice in which no down payments are required but in hire purchase, the normally 20 to 25 % margin money is required to be paid upfront by the hirer. Venture Capital is a money put into an enterprise which may all be lost if enterprise fails. Businessman starting up new business will invest venture capital of his own but he will probably need extra funding from a source other than his own money. However the term venture capital is more specifically associated with putting money usually in return for an equity stake, into a new business, a management buyout or major expansion scheme (Steve Carter, 1997). Many management scholars explained that venture capital is a form of "risk capital". It can be said that capital that is invested in a project where there is a considerable amount of risk relating to the future creation of profits and cash flows. Risk capital is invested as shares (equity) rather than as a loan and the investor requires a higher “rate of return" to compensate him for his risk. Venture Capital is described as equity support to fund a new concepts that involve a higher risk and at the same time, have a high growth and revenue. Venture Capital denotes an investment of long term, equity finance in high risk projects with high rewards possibilities. Venture capital provides long-term, dedicated share capital, to help unquoted companies to grow and prosper. If a businessperson is looking to start-up, expand, buy-into a business, buy-out a business in which he works, turnaround or rejuvenate a company then venture capital is advantageous. Obtaining venture capital is considerably different from raising debt or a loan from a lender. Lenders have a legal right to interest on a loan and repayment of the capital, irrespective of the success or failure of a business. Venture capital is invested in exchange for an equity stake in the business. As a shareholder, the venture capitalist's return is dependent on the growth and success of the business. This return is generally earned when the venture capitalist "exits" by selling its shareholding when the business is sold to another proprietor. Venture capital in the UK originated in the late 18th century, when businesspersons found rich individuals to back their projects on an ad hoc basis. This informal method of financing became an industry in the late 1970s and early 1980s when a number of venture capital firms were founded. The main sources of venture capital in the UK are venture capital firms and private investors. There are now over 100 active venture capital firms in the UK, which provide several billion pounds each year to unquoted companies mostly situated in the UK. Seed Money: Low level financing needed to prove a new idea. Start-up: Early stage firms that need funding for expenses associated with marketing and product development. First-Round: Early sales and manufacturing funds. Second-Round: Working capital for early stage companies that are selling product, but not yet turning a profit. Fourth-Round: Also called bridge financing, it is intended to finance the "going public process"
Long-time horizon: In general, venture capital activities take a longer time such as 5-10 years at a minimum to come out commercially successful; one should, thus, be able to wait patiently for the outcome of the venture. Lack of liquidity: Since the project is expected to run at start-up stage for several years, liquidity may be a greater problem. High risk: The risk of the project is related with management, product and operations. High-tech: A venture capitalist looks not only for high-technology but the innovativeness through which the project can thrive. Equity participation and capital gains: A venture capitalist invests his money in terms of equity. He does not look for any dividend or other benefits, but when the project commercially succeeds, then he can enjoy the capital gain which is his main benefit. Participation in management: Dissimilar to the traditional financier or banker, the venture capitalist can provide managerial expertise to entrepreneurs besides money. In India, ICICI Venture Capital is the first Venture Capital Financing. It was started in 1988 by the joint venture of ICICI and UTI. The UTI launched Venture Capital Unit Scheme (VECAUS-I) to increase finance in 1990. Another big Venture Capital financing institution in India is Technology Development and Information Company (TDICI). Risk Capital and Technology Finance Corporation Ltd. (RCIFC) provides Venture Capital finance to technology based industries. ANZ Grindlays Bank has established India’s first private sector Venture Capital fund. SBI and Canara Bank are also involved in Venture Capital Finance. They offer either equity capital or conditionals loans. -Benefit to the investor is that they are invited to invest only after company starts earning profit, so the risk is less and healthy growth of capital market is entrusted. -Profit to venture capital companies. -Helps them to employ their idle funds into productive avenues. Finance - The venture capitalist injects long-term equity finance, which provides a solid capital base for future growth. Business Partner - The venture capitalist is a business partner, sharing the risks and rewards. Alliances - The venture capitalist also has a network of contacts in many areas that can add value to the company. Facilitation of Exit - The venture capitalist is experienced in the process of preparing a company for an initial public offering (IPO) and facilitating in trade sales. It is found that securing a venture capital deal can be a difficult process due to accounting and legal costs a firm must shoulder. The start-up company must also give up some ownership stake to the venture capital company investing in it. This results in a partial loss of independence that finds venture capitalists involved in decision-making processes. Venture capital deals also come with stipulations and restrictions in composition of the start-up's management team, employee salary and other factors. Additionally, with the venture capital firm literally invested in the company's success, all business operations are under constant scrutiny. The loss of control differs depending on the terms of the venture capital deal. There are legal complicacy in process of venture capital. Issue of shares at discount ordinarily not allowed. Venture capital in India is mainly provided in the form of quaisi equity instruments such as conditional loans. In the event of mismanagement of the affairs of the enterprise or violation of the covenant, these loans are converted into equity (Maheshwari, 1997). Venture capitalist choose to invest in "entrepreneurial businesses". This does not necessarily mean small or new businesses. Somewhat, it is more about the investment's ambitions and potential for growth, rather than by current size. Such businesses have plan to grow rapidly in market. Venture capital investors are only interested in companies with high growth prospects, which are managed by experienced and motivated teams who are capable of accomplishing business objectives. To summarize, leasing is transfer of possession of an asset for use on rent under a contract, no transfer of legal ownership, no intention to buy or sell, return of goods on expiry of lease (Maheshwari, 1997). It can be demonstrated in management studies that Hire Purchase is a kind of instalment purchase where the businessman (hirer) agrees to pay the cost of the equipment in different instalments over a period of time. This instalment shields the principal amount and the interest cost towards the purchase of an asset for the period the asset is utilized. The hirer gets the ownership of the asset as soon as the hire purchase agreement is signed. The hirer becomes the owner of the equipment after paying all amount. 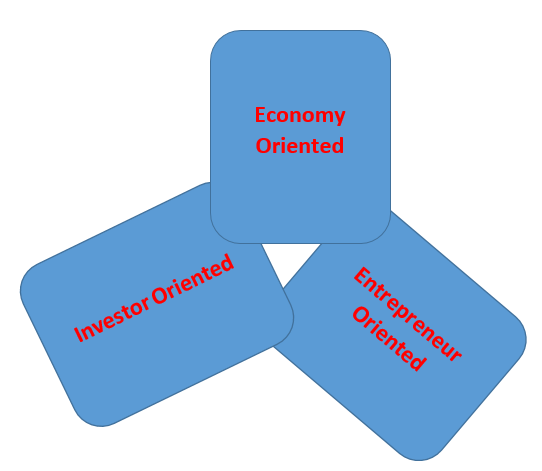 Venture capital in capital market is elaborated as equity or equity related investment in any growth oriented small or medium business to enable the investors to attain corporate objectives in return of minority shareholding in the business or irrevocable rights to acquire it (Maheshwari, 1997).